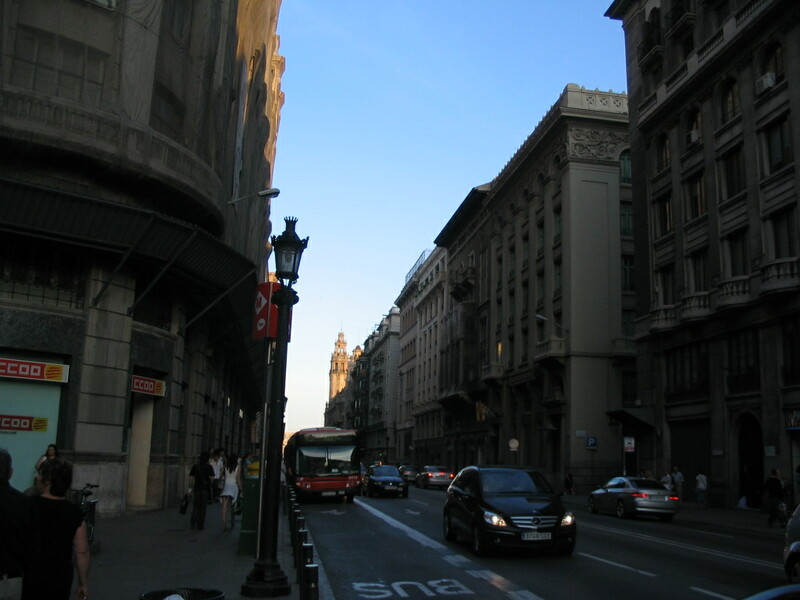 I could have taken a metro ride or a cab to the apartment across the Ciutat Vella (Old City) from the Estació, but there was no question in my mind that I would walk the 2 km there instead, in order to start orienting myself in the city right away. 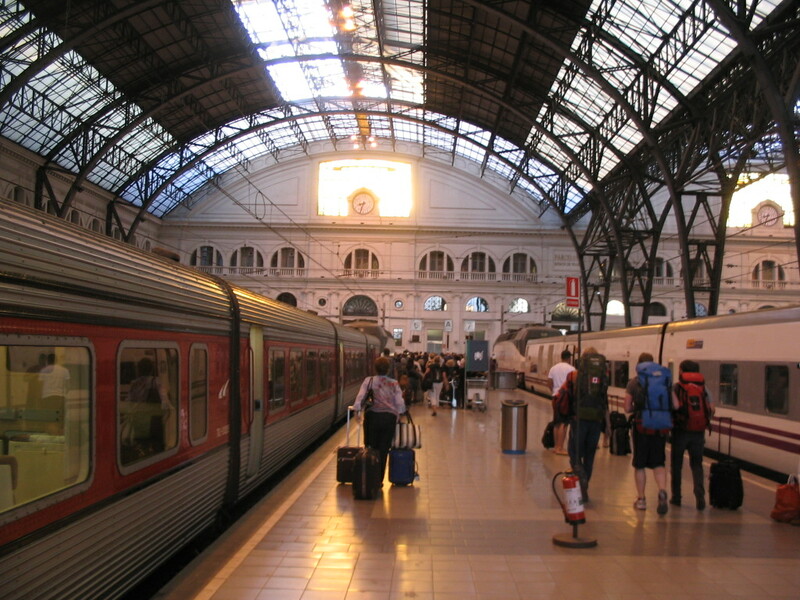 The Estació's trainsheds are terribly elegant. 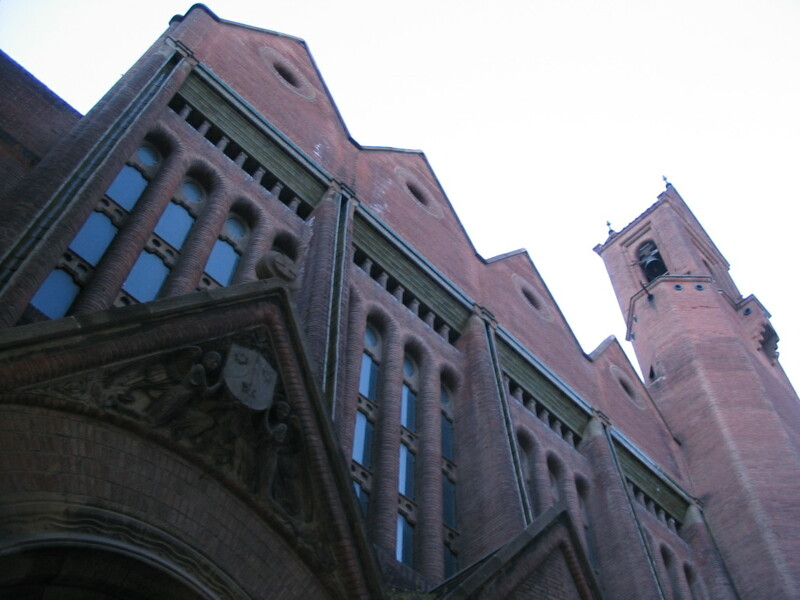 The building was constructed in its present form in 1929. 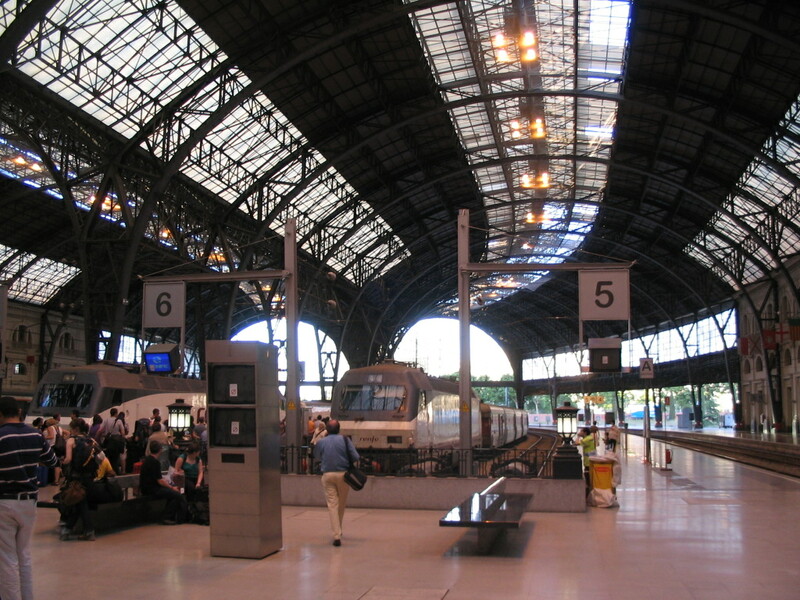 One of the coolest things about the Estació is that the trainsheds curve, as see here, so they have a toric form overall. 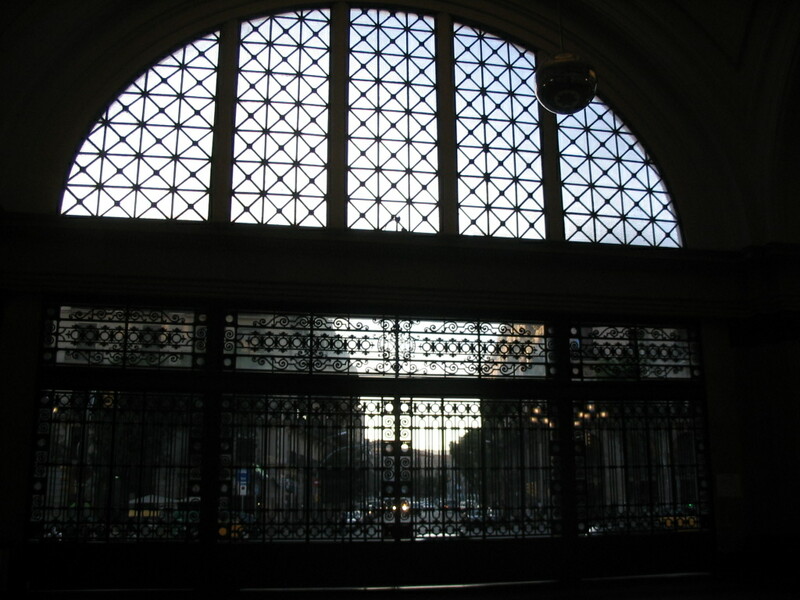 Peering through the screens of the station's front hall out into the Ciutat Vella. 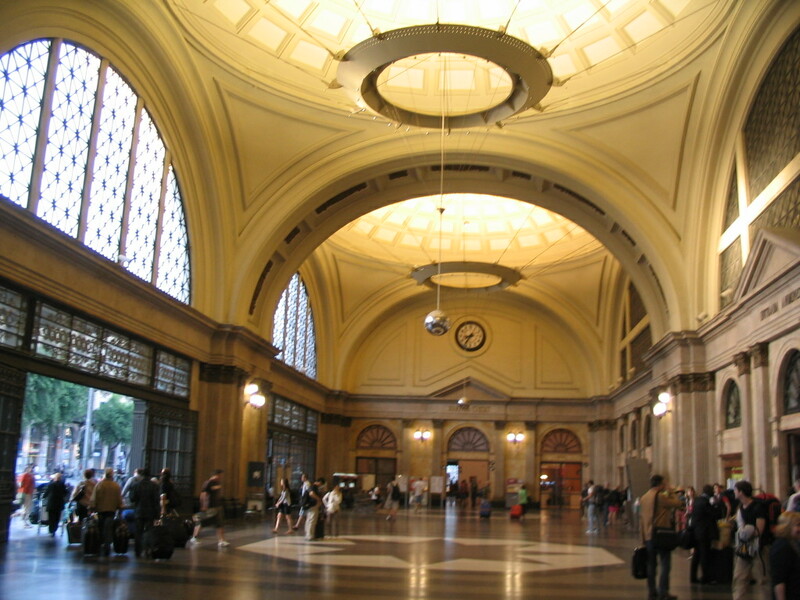 The grand, almost nave-like front hall. Setting out toward the apartment, with last sun still shining even after 8:30PM. 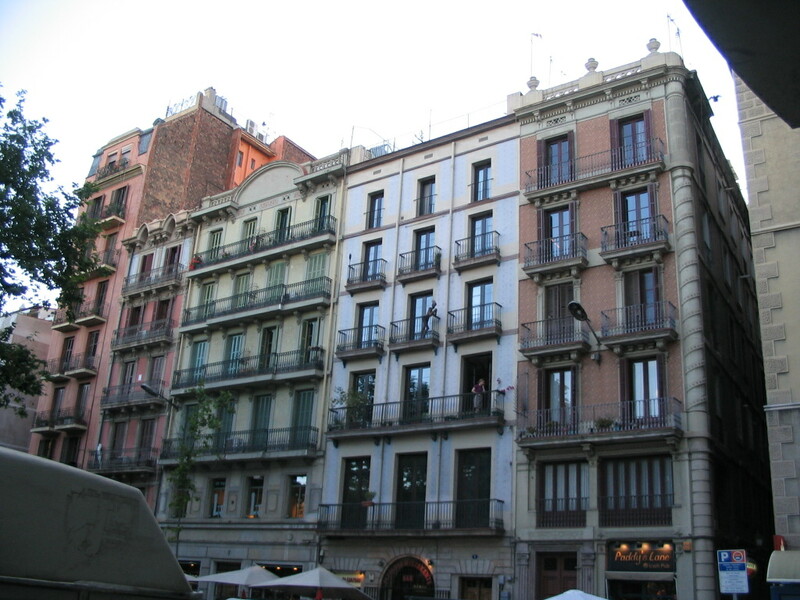 At the nearby Plaça Pla del Palau, a full wheel of muted colors. 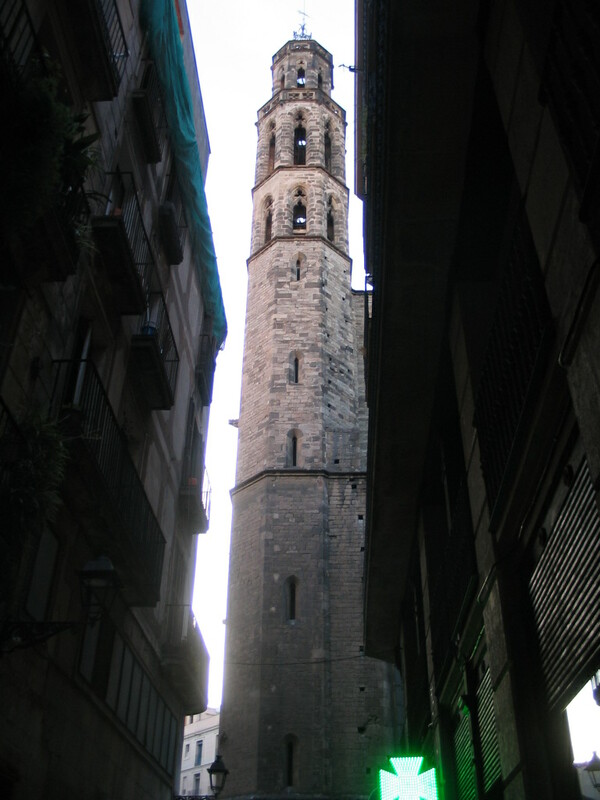 Slinking from the Plaça into the old city on Carrer l'Espaseria brings into view one corner of the church of Santa Maria del Mar. 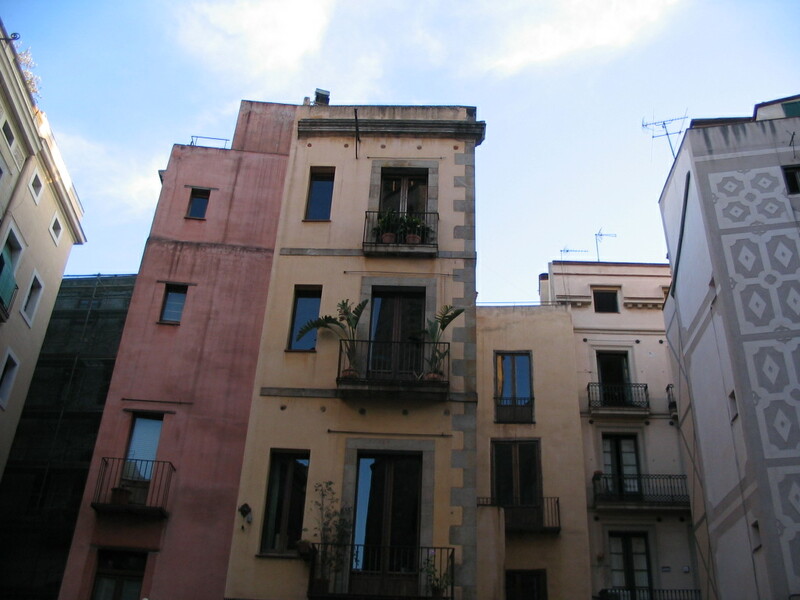 An elemental conglomeration across the square from Santa Maria del Mar. But lo, could this be more sunlight, even at 8:45? Indeed! 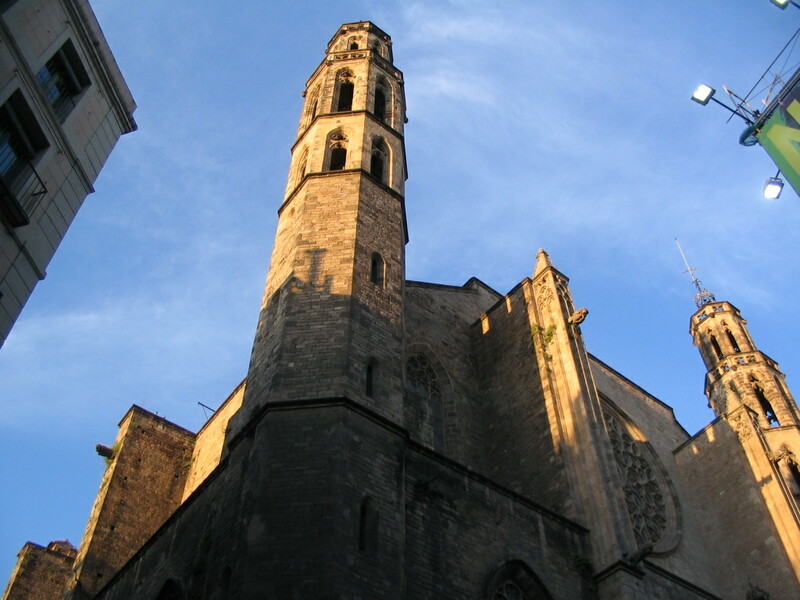 Here a wider view of Santa Maria del Mar, with its strangely rectilinear buttresses. 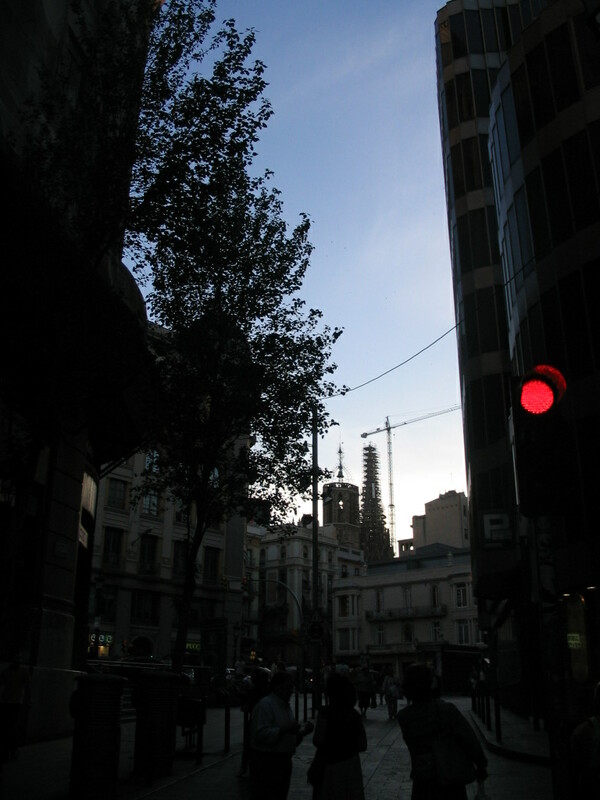 At the Via Laietana, one of the thoroughfares in the Ciutat Vella, is a glimpse over to the cathedral, its scaffolding-covered tower giving its identity away. 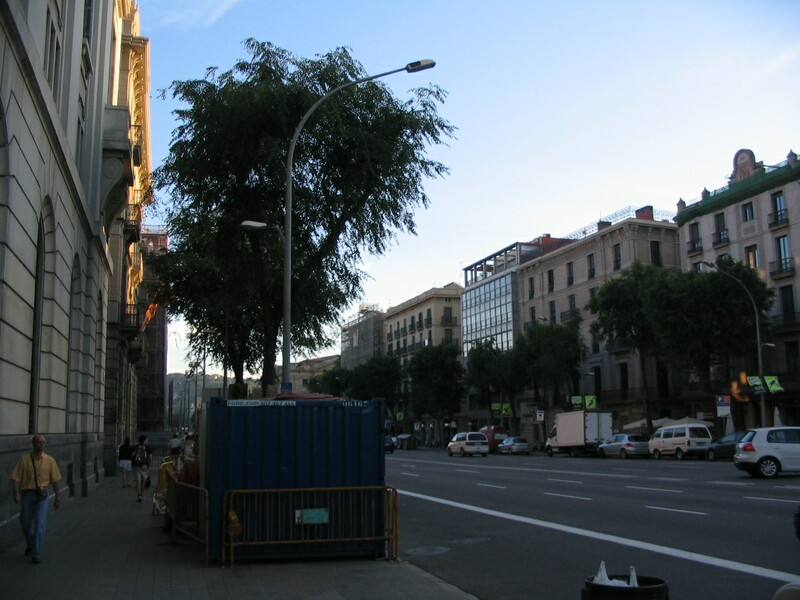 Looking in the other direction down Via Laietana, southeast and seaward. 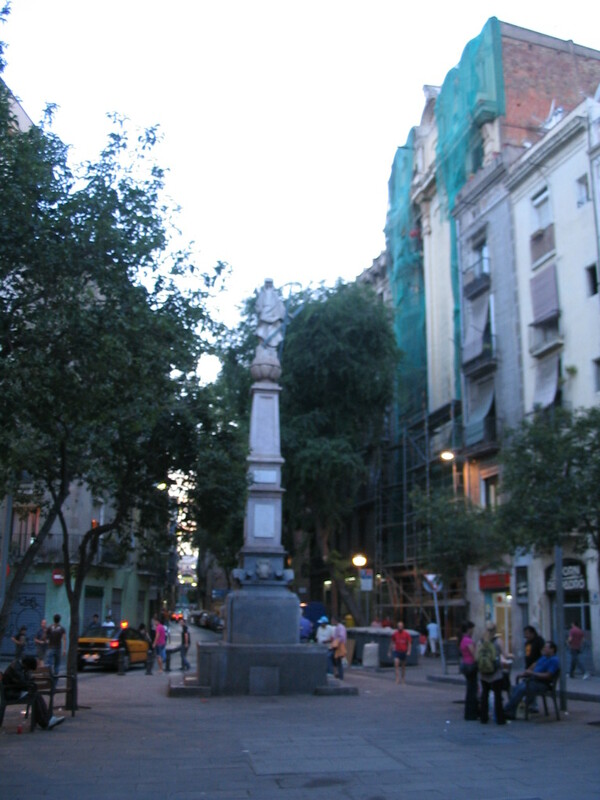 Further along is the central square of the old city, Plaça Sant Jaume. 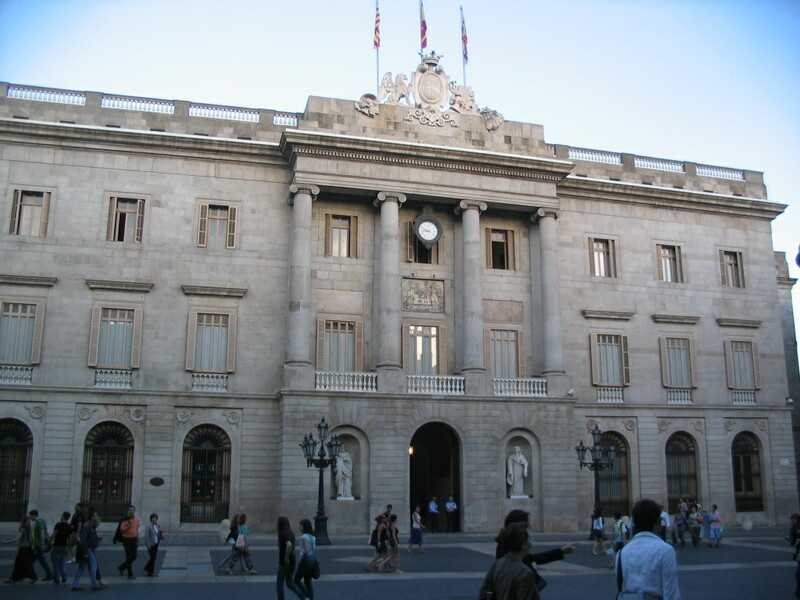 Here the Ajuntament (city hall) and the Palau de la Generalitat de Catalunya (seat of the Catalan government) face each other across the square. 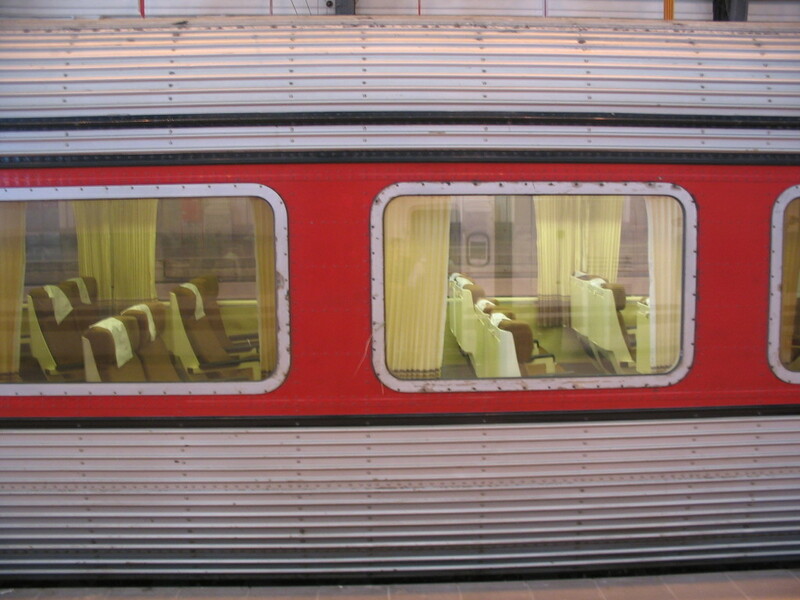 Pictured is the Ajuntament. 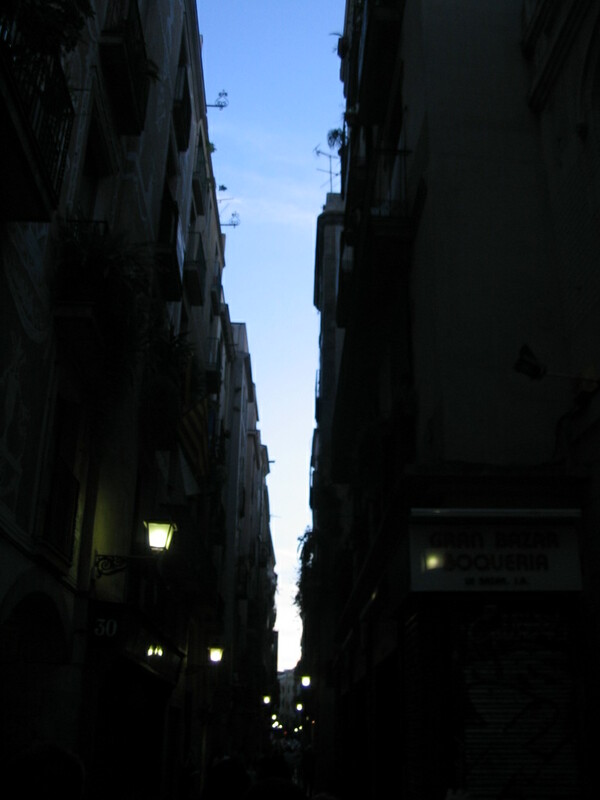 A sky wedge is often all that is visible due to the general hyper-oversquareness of the Ciutat Vella's streets. 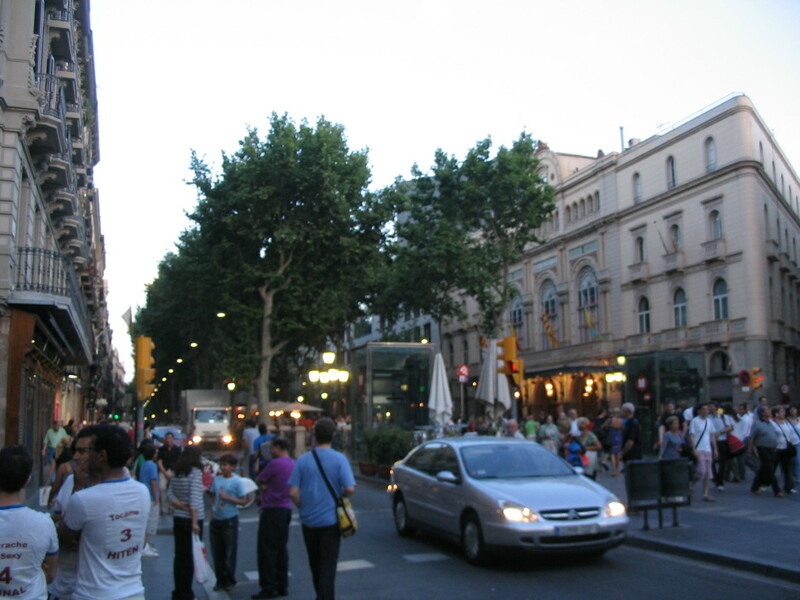 Then across Las Ramblas, the famous boulevard, seemingly always packed to the gills, into the Raval quarter, where our apartment was situated. 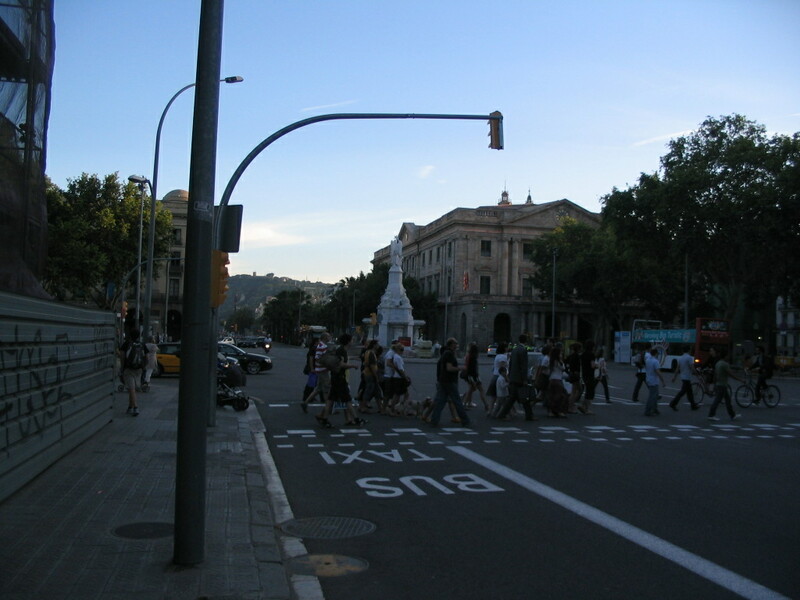 Almost there — this is the Plaça del Pedró at the confluence of Carrer de l'Hospital and Carrer Carme. 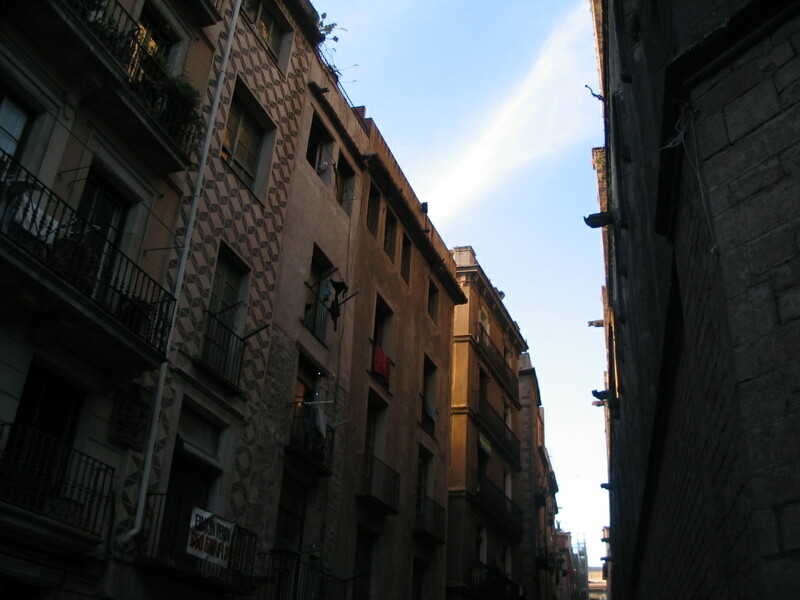 Just off the square was our street, Carrer Bisbe Laguarda, which also contains this church, the Parròquia de la Mare de Déu del Carme, compactly slotted into the fabric of the block and yet having a richly idiosyncratic style. 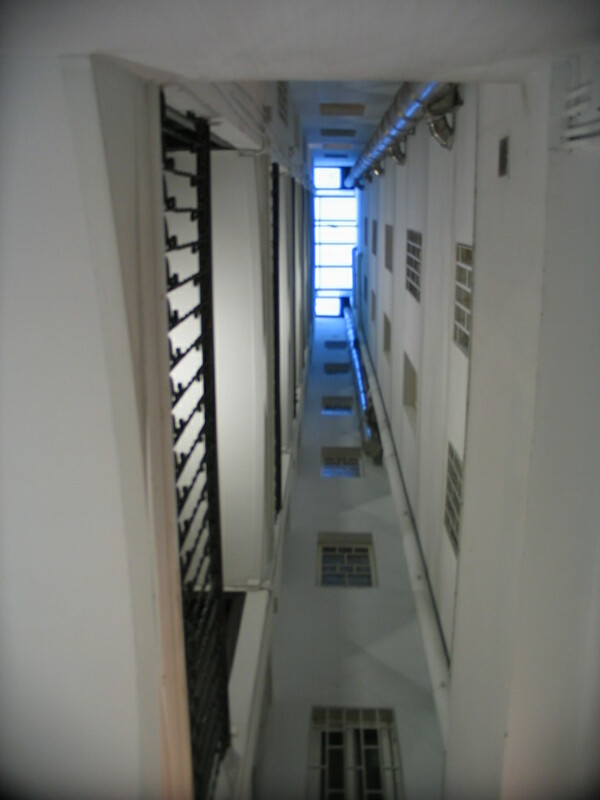 Into the apartment building for a nice open view all the way to the roof. 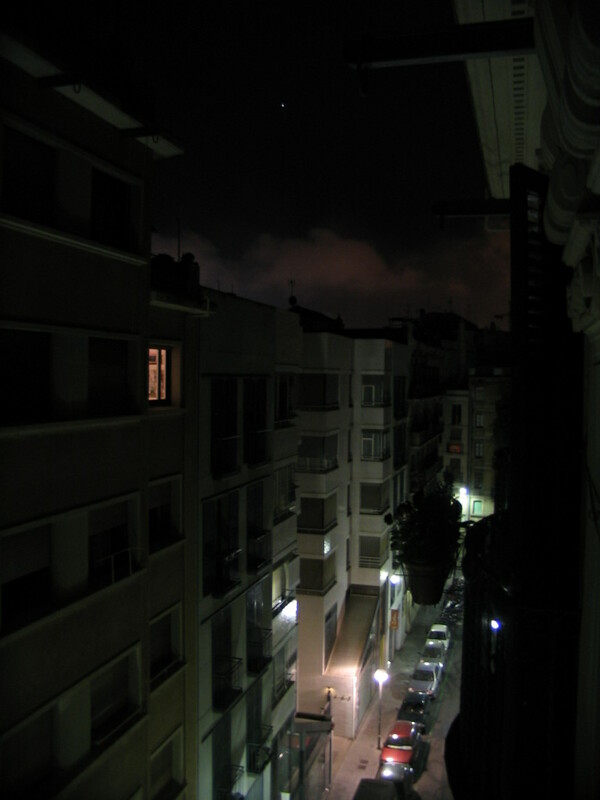 Finally, a nighttime peek down the street from the apartment's narrow balcony. I think we were on the sixth floor.